Alan Shepard was part of the first group of seven astronauts selected by NASA in 1959, then a nascent agency created to secure America's place in the Space Race against the former Soviet Union. Shepard, a military test pilot, became the first American to fly in space in 1961, and then went to the Moon in 1971 as commander of the Apollo 14 space mission. Full Name: Alan Bartlett Shepard, Jr. Interesting Fact: Alan Shepard was one of the original seven astronauts selected by NASA. His claim to fame, the first voyage to space, was a 15-minute suborbital flight aboard the Freedom 7 spacecraft in 1961. He later became the first astronaut to play golf on the Moon during the Apollo 14 mission in 1971. Alan Bartlett Shepard, Jr. was born on November 18, 1923, in East Derry, New Hampshire, to Alan B. Shepard, Sr. and Pauline R. Shepard. He attended Adams school in Derry, New Hampshire, and then Pinkerton Academy. Upon graduation from high school, he applied to the United States Naval Academy at Annapolis but had to wait a year because he was too young to enter. He finally began attending the Academy in 1941 and graduated in 1944 with a Bachelor of Science degree. During his time at Annapolis, Shepard excelled at sailing and ended up racing in regattas. Shepard served during the final years of World War II aboard a destroyer before moving on to the Naval Air Station at Corpus Christi, Texas. While on duty aboard the destroyer, he married his longtime sweetheart, Louise Brewer. After arriving in Texas, he started basic flight training, supplemented with private flying lessons. He received his naval aviator wings and then was assigned to a fighter squadron. In 1950, Shepard transferred to the United States Naval Test Pilot School at Patuxent River in Maryland. There, he made a number of flights and exploited his maverick status on more than one occasion. At one point, he flew under the Chesapeake Bay Bridge and made low passes over Ocean City, earning a threat of a court-martial. He avoided that, but the incident cemented his reputation as a troublemaker. Shepard was next assigned to a night fighter squadron out of Moffat Field, California. After several years of flying various aircraft, Shepard attracted the attention of astronaut recruiters. The U.S. government's urgency to reach space grew in response to the Soviet Union's successful Sputnik flight in 1957, while the United States was scrambling to build up a space presence. Before leaving the Navy, Shepard had logged more than 3,600 hours of flying time. He had attended Naval War College and worked as an Aircraft Readiness Officer for the Atlantic Fleet. Alan Shepard was selected to be an astronaut for the newly formed National Aeronautics and Space Administration on April 1, 1959. He immediately became part of the Mercury 7 group of trainees for Project Mercury. His first flight was aboard Freedom 7, which lifted off from Florida on May 5, 1961. By that time, the Russians had flown cosmonaut Yuri Gagarin to space, making Shepard the second human to go to space. While Gagarin's flight had been an orbital mission, Shepard's launch took him only on a 15-minute sub-orbital path, which nonetheless lifted American spirits and made him an instant hero. At the end of the Mercury missions, Shepard shifted over to work as Chief Astronaut on Project Gemini. He was supposed to be on the first flight, but a diagnosis of Meniere's disease in his inner ear grounded him. His job instead was to develop astronaut training programs and work on the selection of the next astronaut candidates. In 1968, Shepard underwent surgery for his ear problems. After recuperation, he was put back on flight status, and Shepard began training for an upcoming Apollo mission. In January 1971, Shepard and his crew of Edgar Mitchell and Stuart Roosa lifted off aboard Apollo 14 for a trip to the Moon. At the time he was 47, and that made him the oldest person to make the trip. While there, Shepard brought out a makeshift golf club and swung at two balls across the lunar surface. After Apollo 14, Shepard returned to his duties in the Astronaut Office. He also served as a delegate to the UN under Richard Nixon and was promoted to rear admiral in 1971. Shepard stayed with NASA until 1974, when he retired. After his years at NASA, Alan Shepard was asked to sit on the boards of various corporations and groups. He invested in real estate and banking, amassing a considerable amount of money. He also founded the Mercury 7 scholarship foundation, which is now the Astronaut Scholarship Foundation. It provides tuition and expenses for students pursuing science and engineering. Shepard began writing in retirement, publishing a book called "Moon Shot" in 1994. He was also made a fellow of the American Astronautical Society, and of the Society of Experimental Test Pilots. In addition, as a descendant of some of the first colonists in America, he was a member of the Mayflower Society. Shepard was also a director of the National Space Institute. Alan Shepard was diagnosed with leukemia in 1996. Despite aggressive treatment, he died from complications in 1998. His wife died a month after he did, and their ashes were scattered at sea together. For his many accomplishments, Alan B. Shepard was honored with numerous awards, including honorary doctorates, medals, and shrines at the Astronaut Hall of Fame and the International Space Hall of Fame. After his flight in Freedom 7, he and his wife were invited to the White House to meet President Kennedy and Jacqueline Kennedy, along with Vice President Lyndon Johnson. Kennedy presented him with the NASA Distinguished Service Medal. He later was given the Navy Distinguished Service Medal for his work on the Apollo 14 mission. More recently, the Blue Origins company named one of its rockets (designed to carry tourists to space), the New Shepard, in his memory. The Navy has named a ship in his honor, and there are schools and post offices bearing his name, and more recently, the United States Post office issued a first-class stamp with his name and likeness on it. Shepard remains a popular figure among space enthusiasts, and he has been portrayed in a number of TV movies and miniseries. 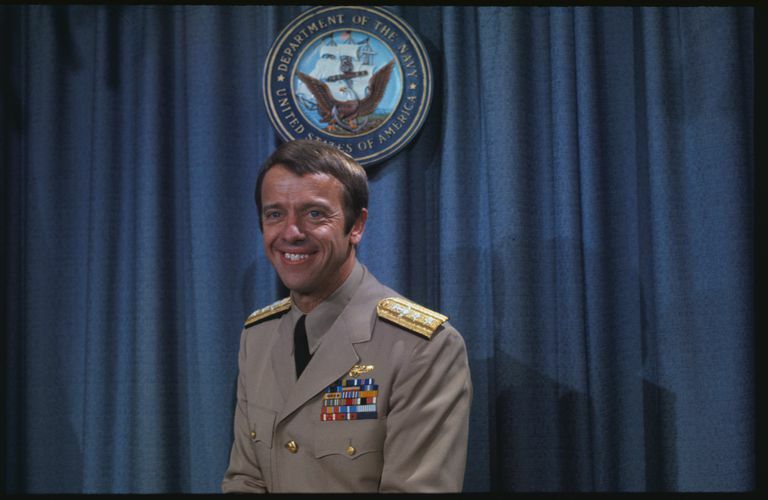 “Admiral Alan B. Shepard, Jr., USN.” Academy of Achievement, www.achievement.org/achiever/admiral-alan-shepard-jr/. Godlewski, Nina. “It's Been 58 Years since Alan Shepard Blasted off to Space and Made American History.” Newsweek, 5 May 2018, www.newsweek.com/first-american-space-alan-shepard-911531. Chicago Tribune. “LOUISE SHEPARD DIES A MONTH AFTER HER ASTRONAUT HUSBAND.” Chicagotribune.com, 29 Aug. 2018, www.chicagotribune.com/news/ct-xpm-1998-08-27-9808280089-story.html.